which works a treat for me. I think you might need to add a space between  and Heal. Does that solve the problem? Is there an error message that displays when you use the macro? Or does it simply do nothing? Any detail you will be able to provide will help. Also, there are different "cases" of mouseover. You can mouseover in raid frames, you can mouseover a target directly, or you can mouseover the target's portrait, if you have selected it. Have you tried all cases? If an addon is causing the problem, it will most usually only block mouseover in raid frames. If you do not use #showtooltip, it will not show a tooltip. If you use #showtooltip, then it will show the tooltip of the first spell you cast in the macro. If you use #showtooltip X, then it will show you the tooltip of spell X, regardless of what spells you cast in the macro. Back to your problem. Be assured that I won't rest until we have found the cause of it. Can you disable all your addons and try to see if the macro works? Also, you need to make sure that what you are trying to use on your action bar is indeed the macro. Once I had a similar issue as yours and it turned out that I had put a spell with the same icon as my macro on my action bar. Finally, could you please make a screenshot of the macro window, with the macro open, and post it here? All this talk about mouseover macros, do they really make that much of a difference? Im still a clicker myself (using grid) - I find it still makes me "feel" like Im more engaged rather than just mouse overs. I did try them once a long time ago but didnt really seem to suit me. I dont think I suffer too much as Im always changing my targets within the GCD time, or should I give it another go? It's basically a way to avoid useless information, as well as save me some clicks. It's especially good with instant spells, such as renew, since you often want to spread it, but rarely want to cast more than that spell, before changing targets. I think it's a preferance thing, more than anything else though. Sometimes modified to hide the error messages. This sort of macro allows me to have eg the tank as target and cast heals on him and when others need healing I simply move my cursor over the player that needs healing and can continue afterwards healing the tank without having to find his unitframe again or do 2+ clicks. When I play on my laptop mouseover macros makes healing much easier with the trackpad than having to click each time too :P.. 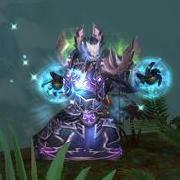 Cheers for the blog Madmonk pass on my thanks to your guildy :D! Think I will use these last few weeks of Cata to really get into them then. i didn't copy it but wrote it, cos the copy gave a square that wasn't visisble in the macro tekst. but wat do i excactly have to do ? i see the image that belongs with the spell, but if i hover over my target nothing happens. You have to hover your mouse over the target and then press the keybind. Do however keep in mind that the macro won't work if you bind it to a mousekey (like mouse 4, mouse 5 or any other) and target a unitframe. The reason for this is that when clicking any of those mousekeys while hovering over a unitframe, will make WoW think you want to select the unitframe and the macro won't be executed. Although I don't actually use it a lot. For leap of faith I normally just click the target and then press the normal-non macroed spell. aha thanks a lot, must be the space..
1. Heals you, as long as you push "alt". 2. Heals your mouseover target, as long as it is an ally and he/she is not dead. 3. Heals your current target, as long as it is an ally and he/she is not dead. 3. Heals your current target's target, as long as it is an ally and he/she is not dead. It will save you the trouble of making mouseover macros for each spell. You can simple keybind them from your spellbook. I use this with the World of Warcraft mouse for more button options on my mouse. Nothing could be easier!